Semi-Private Surf Lessons | Kele surf school, Cabarete, Encuentro beach..
Semi-Private Surf Lessons is not the same if it's not taught at Kele Surf School, Cabarete. If you and your partner are adventurers who would like to experience Surfing together, we definitely recommend you this package! It consists on 2 or 3 surfers with 1 surf instructor per lesson. 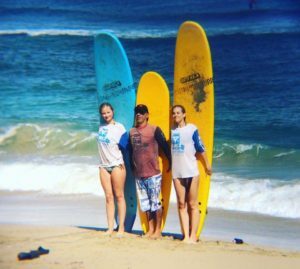 Our surf instructor is there to help you learn and provide you advise on all questions related to surfing. Join us and make your surfing dreams come true!! !